It sure seemed like a great idea to rob the Pyramid of Pengqueen of its artifacts, but ever since you arrived, you can’t shake the sense that you’re being watched, that some malevolent presence is following your every move and trying to draw you to itself. 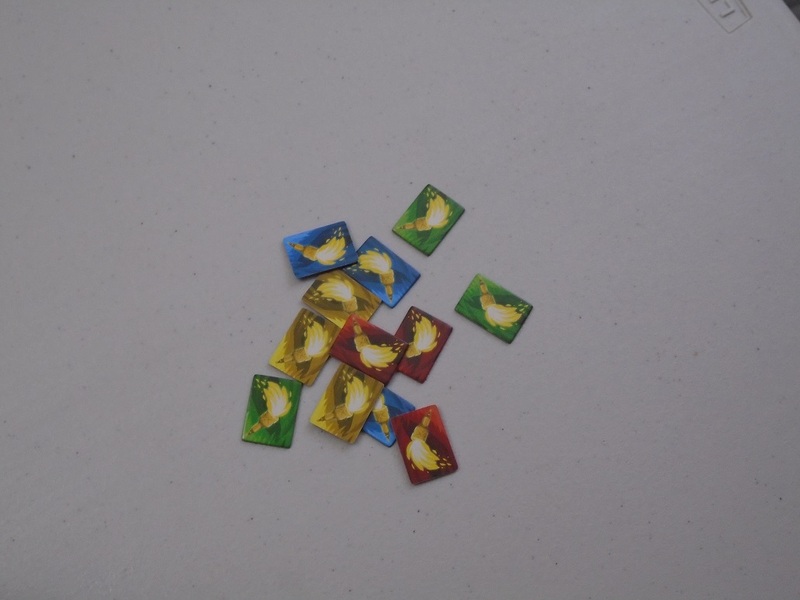 Pyramid of Pengqueen is a hidden movement and deduction game for two to five players. One player is the Pengqueen, trying to prevent the adventurers (other players) from stealing her treasures. The game ends when either one adventurer collects all five of their treasures or the Pengqueen catches the adventurers a certain number of times. That player wins. Pyramid of Pengqueen set up for five players. 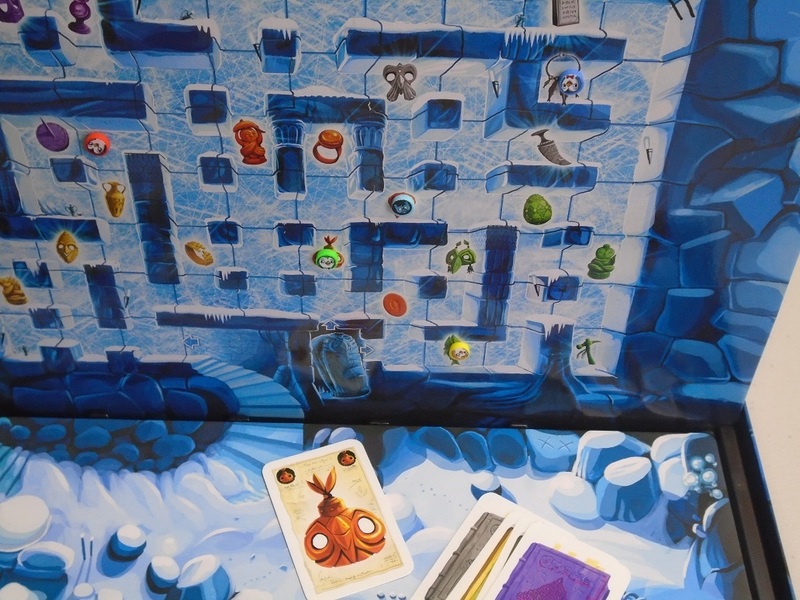 The board is upright between the players with the mummy on one side and the adventurers on the other. To begin, place the box in the center of the table with the magnetic insert slotted upwards and the appropriate insert overlays in place. The Pengqueen player will sit on one side of the table, and the adventurers will sit on the other. Each adventurer receives three life tokens and one treasure from each of the five colored stacks. 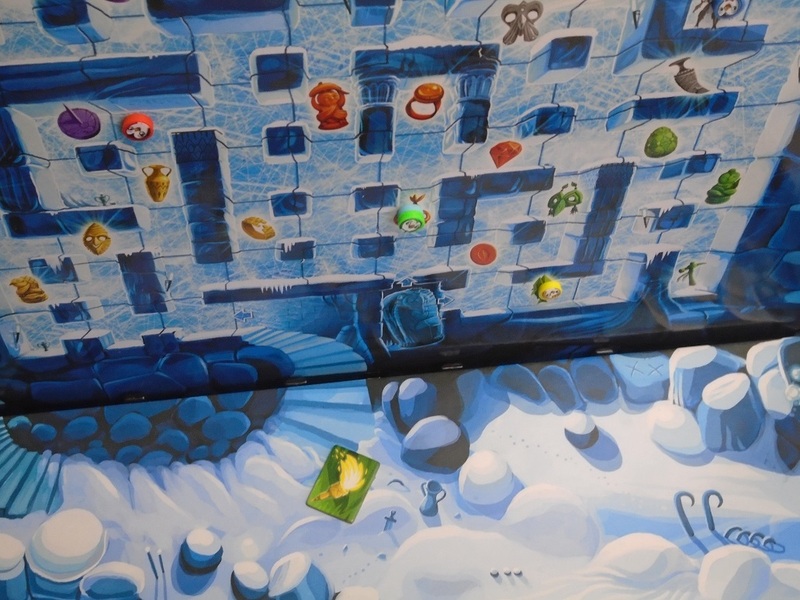 The adventurers place their magnet pawns on the starting space on their side of the board. 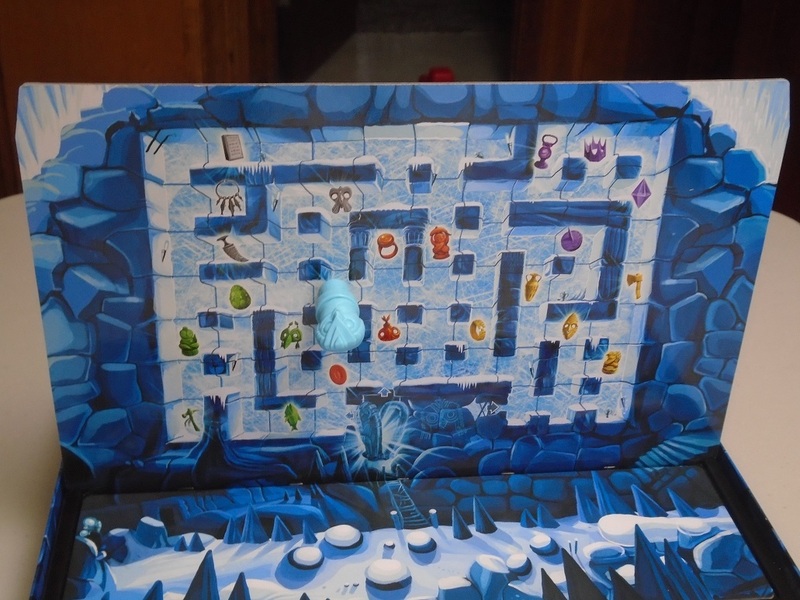 The Pengqueen places their large pawn on their side of the board and a small marker (connected by magnet) on the adventurer side of the board on the sarcophagus space. The first player clockwise from the Pengqueen will go first. On each adventurer’s turn, they will roll any dice not showing mummy faces and choose a result. They may reroll these dice any number of times, but when a die shows a mummy face, it is set aside until one player resets the dice. The dice range from 1 to 4 and have a mummy face and an arrow face. When an adventurer chooses a number die, the adventurer moves orthogonally that many spaces (and may double back over spaces already covered). If the adventurer chooses the arrow, they move their pawn in one orthogonal direction until they hit an obstacle. What the penguin players see when they play. If an adventurer lands on one of the treasure cards in their hand, they may reveal it to claim the treasure. The Pengqueen player takes a turn after all the adventurers have had a turn. The Pengqueen player rolls the black die and adds the mummy faces on it to the set aside white dice mummy faces and moves that many spaces. If the Pengqueen moves onto the space with an adventurer, that adventurer surrenders a life token to the Pengqueen and gets sent to the sarcophagus. The Pengqueen’s turn ends when either she runs out of spaces to move or she catches an adventurer. What the mummy player sees. Now where could the other players be hiding? 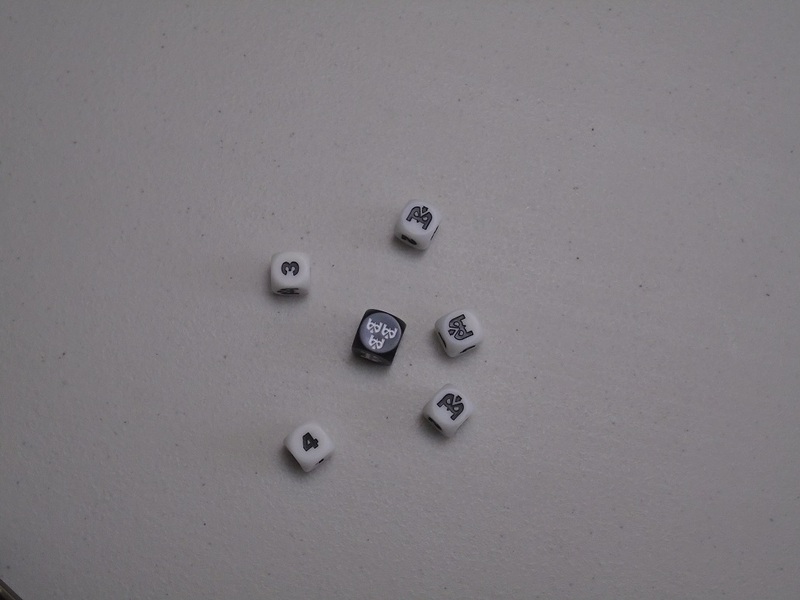 At the start of any adventurer’s turn, the adventurer may reset the white dice showing mummy faces, allowing them all to be rolled. 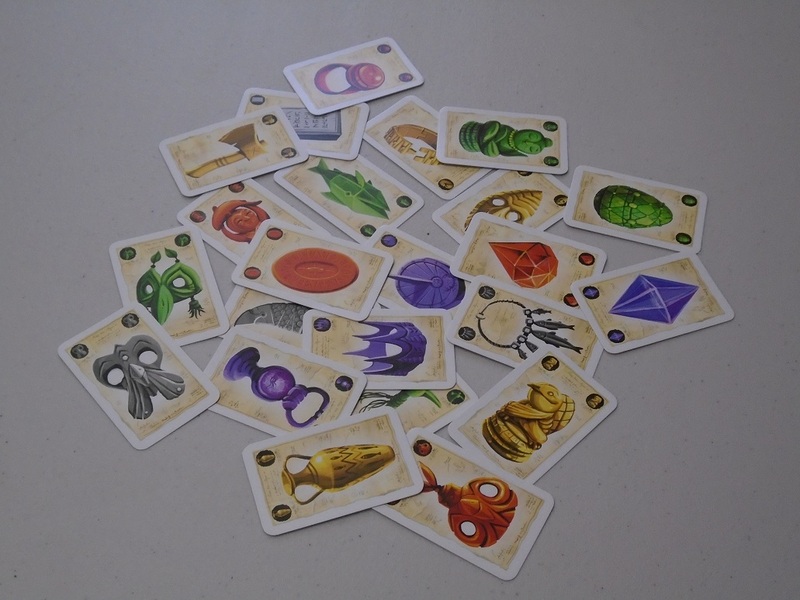 Before the dice are rolled, however, the Pengqueen takes an interrupting turn, moving the number of mummy faces shown on the previously locked dice. An adventurer who loses all their life tokens to the Pengqueen is out of the game. An adventurer wins once they collect all five treasures shown on their cards. The Pengqueen wins if they catch adventurers a certain number of times (depending on the number of players). Pyramid of Pengqueen is a silly game with a silly premise that, despite its silliness (and partially because of it), is still fairly compelling. When people think of the hidden movement genre, they might think of Scotland Yard–the Spiel des Jahres-winning gateway of yesteryear–but more than likely their minds go to complex, heavy, thematic deduction games like Fury of Dracula, Hunt for the Ring, or Letters from Whitechapel, games that will get your blood pumping, and hopefully to your brain, because you’ll need your logic and wits as much as your adrenaline. Pyramid of Pengqueen is a welcome deviation from these meatier affairs. The rules are dead simple–land on the right spots without getting caught–and there’s a clever gimmick to enjoy too. It can be dangerous to reveal your location to the Pengqueen. I try to pretend that gimmicks won’t sway me in games, but they undoubtedly do. I like cool novelties as much as the next person, and the novelty in Pyramid of Pengqueen is an especially good one. 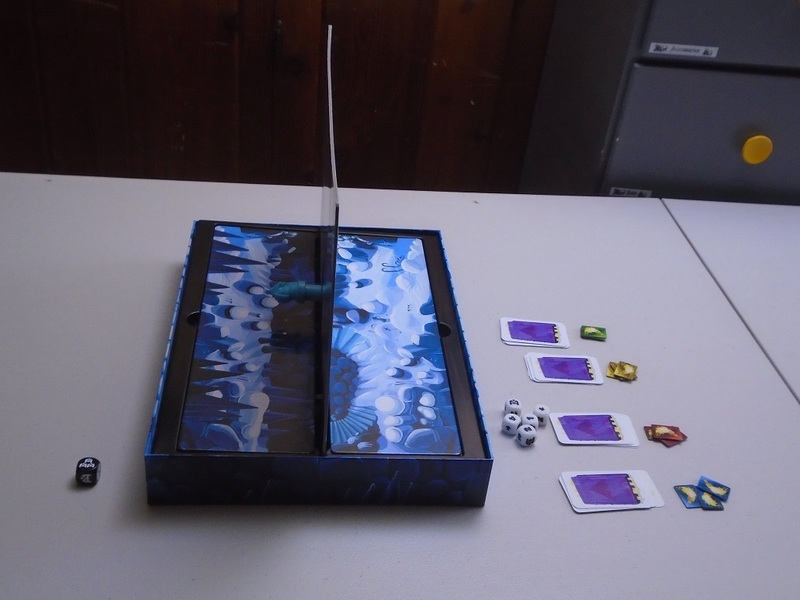 It’s a competitive game where one player sits opposite all the others, kind of like Battleship, but the players play on a common board with magnets. Are the magnets necessary? Well, maybe not, at least if you trust your opponents. (“You sank my Battleship!”) But it’s quite gratifying to hear the click of an opponent’s pawn getting caught by the Pengqueen, and it’s hard to overstate how anxious you will become as you watch the Pengqueen’s pawn move closer and closer to your own, all through the magic of magnets. The problem with gimmicks is that, once the gimmick wears off, there needs to be a good game in place to sustain interest. Here, while the gimmick is probably the main reason to play Pyramid of Pengqueen, the game is interesting enough that it should be worth playing even with players who have seen its tricks before. Caught! The green player loses one life token, moving the Pengqueen player closer to victory. The reason for this is that, while the game has some obvious random elements (the roll of the dice, especially determining whether the mummy moves more or less often), the players are in control of where and how they move and of whether they should risk another roll of the dice to get the result they want (possibly empowering the mummy in the process). Players are trying to read one another’s minds, and there is a satisfying game of cat and mouse as they try to outwit each other. And whether the outwitting works or not, it’s fun to try, and the more you play, the more you’re willing to venture into riskier gambits. In one game, I decided to take the most circumspect route I could, avoiding giving the Pengqueen player any information. In another game, I decided to move close to the Pengqueen. Surely the Pengqueen player wouldn’t think I’d be so cavalier with my moves. As I watched the slow-motion movement of the Pengqueen on my side of the board, I thought, Surely, now is the time she will turn aside… But the Pengqueen walked straight for me, and that lost us the game. There are decisions to make whether you are an adventurer or the Pengqueen, and both roles are fun. The custom dice give options to the penguin players, but eventually they will become movement for the mummy. Don’t get me wrong: this is a light deduction game, light enough that even older children can play along. You can still feel good about a win, but behind every win, there’s probably some luck at play too. The game seems weighted in the Pengqueen’s favor, which makes an adventurer win all the sweeter, but it can become frustrating to feel hamstrung by the movement of the Pengqueen. Claiming a treasure requires revealing your location, and a lot can happen between one turn and the next (especially in a game with more players), making it harder to predict when is the right time to risk taking a treasure. There’s no real way to know, which, again, makes Pyramid of Pengqueen a light affair. Players who are overly concerned about winning probably won’t be enamored of the gimmick for long. Despite this, it’s still fun with adults as a filler. Again, the gimmick helps to overcome any shortcoming in the luck department, at least for players who are able to inhabit the spirit of the game, and this is the kind of game that, if you don’t bring it out every game night, will at least retain its shine if you bring it out sparingly. My kids aren’t quite old enough for this, but I can’t wait to play with my nieces at Christmastime. I think they’ll love this, and I won’t mind playing with them either. The treasure cards. Each player gets one of each, and whenever a treasure is claimed, the player must reveal their location to the Pengqueen. Pyramid of Pengqueen, like any game with a strong gimmick, largely works because of its components. 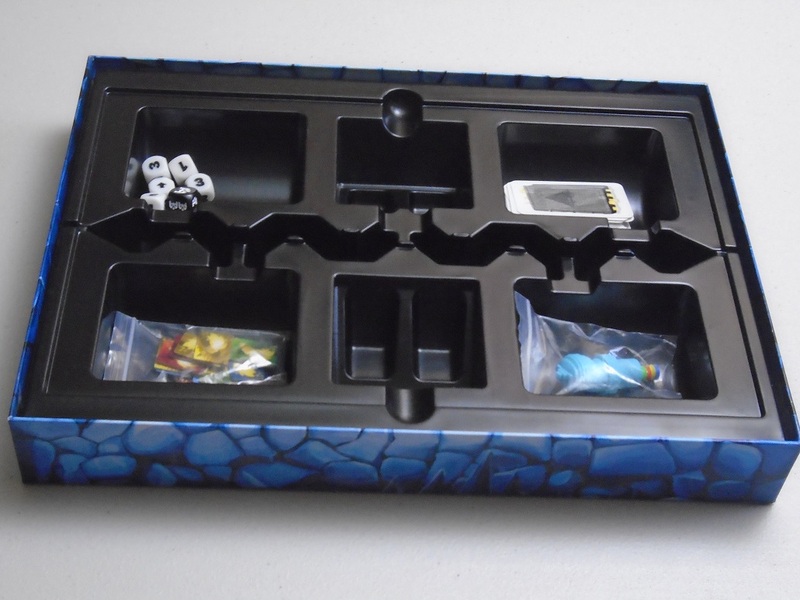 The box is the right size to hold everything, and while it’s a little larger than I’d like (and a nonstandard size, at least in hobby board game terms), it justifies its size by the way the box acts as a component in the game. The magnets work perfectly, at least while following the guidelines in the rulebook (keep penguin pawns in the center of each square). Unless players have cheated, each catch by the Pengqueen has worked flawlessly. 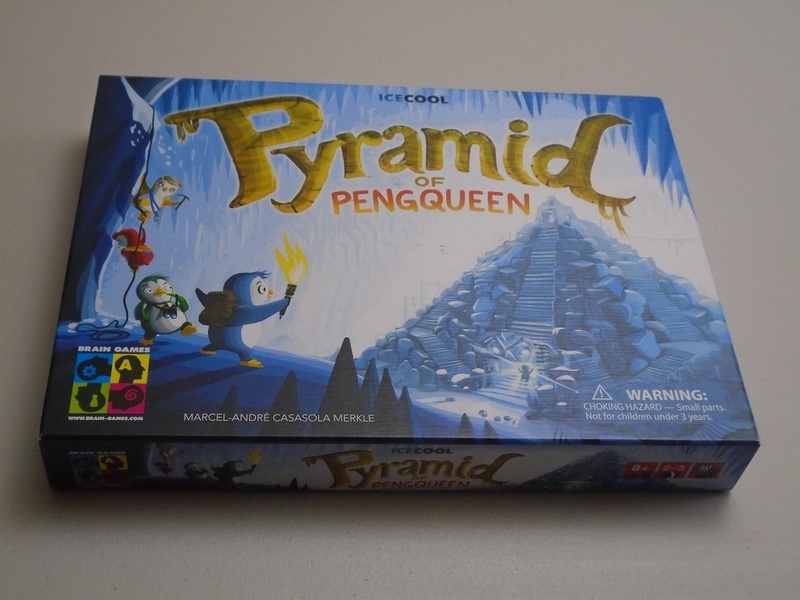 The theme of the game–formerly a pyramid, now an ice pyramid with penguins–is a little strange and has caused puzzled looks each game, but it’s not as ill-suited as it seems at first blush, and players quickly adapt because the game is engrossing. In fact, I kind of like the silly premise as this is already a bit of a silly game. The only things I wish were different are the penguin adventurer pawns, which are tiny magnetic divots. They’re a little hard to move around–at least for my fat fingers–and they seem like the weakest link in an otherwise fine production. They’re not bad enough to keep me from recommending the game, though. Life tokens. The Pengqueen must collect a certain number of these to win. It’s worth mentioning that, because the players have to move pawns on the central board and want to do so secretly, it’s possible that the Pengqueen player can gain more information than intended by watching the adventurer players or seeing how the board moves around or listening to sliding pieces. 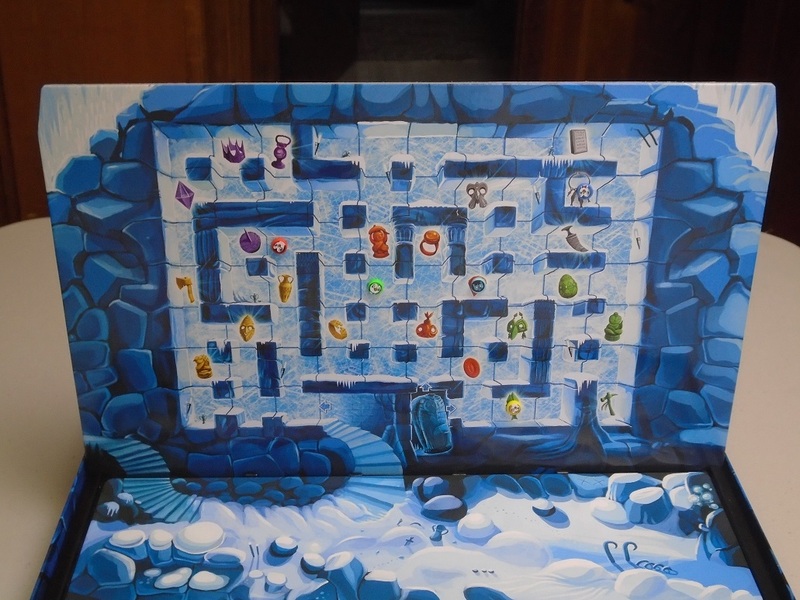 In my groups, the Pengqueen player has closed their eyes once the adventurers began moving pieces, and the adventurers often tap the table or the board while moving pieces to avoid giving information away. Each group can handle this differently; I don’t view it as a problem so much as something to be aware of. I’ve played the game with three and five players. The game scales pretty well, although the five-player game is about twice the length of the three-player game. We were able to knock out three-player games in about fifteen to twenty minutes, whereas our five player games clocked in closer to the forty minutes shown on the box. The three-player game is definitely right in terms of a return on investment for the time spent learning the rules. The five-player game ran longer than I wanted it to, although I wouldn’t say I was checking my watch. It’s just fun when games are quick because players can rotate into the Pengqueen position and try it for themselves. The insert. Usually I would balk at a game with this much “wasted” space in the box, but here, the box is a main component in the game, so it’s forgivable. Pyramid of Pengqueen probably won’t wow fans of heavy games, but I think it will be a hit for most others. It’s simple, engaging, and clever, and the silliness of the premise and the strength of the gimmick will work to lower the defenses of players who might usually judge simple games beneath them. Pyramid of Pengqueen is a worthy addition to your collection, especially for groups that include older children or casual gamers, and it’s one I plan to keep around until my kids are old enough to play it. And until then, I’ll play it sparingly in my adult groups too, because it’s good enough for both audiences in moderation. iSlaytheDragon would like to thank Brain Games for providing us with a copy of Pyramid of Pengqueen for review.